Hawley Grade, once a Pony Express route over Echo Summit, commences at the top of Echo Summit on Highway 50, just 4 miles southwest of Meyers, and plummets 960 feet in a short 2.1 miles of single-track, to South Upper Truckee Road in Christmas Valley. 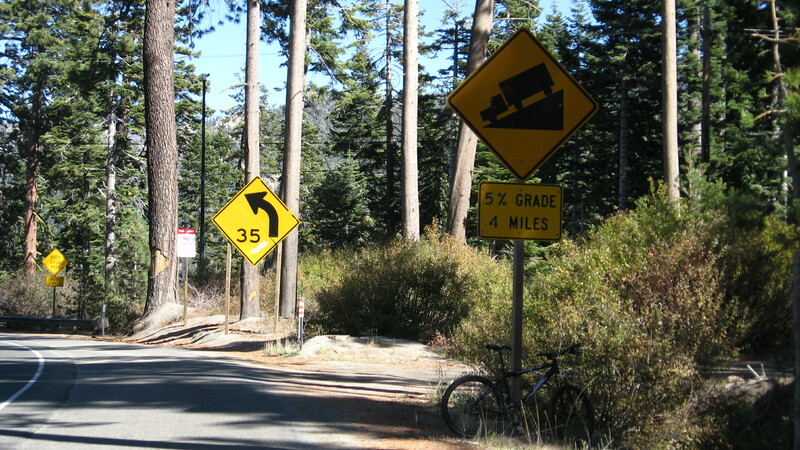 If traveling from South Lake Tahoe, the trailhead is located on the left-hand side of Highway 50, on unpaved, unsigned Echo Summit Road South, hardly before the true apex of Echo Summit, between the “5% Grade, 4 Miles” and “curved 35 mph” yellow traffic signs. Right out of the starting gates, Hawley Grade sprints to the front of the elite pack, offering highly technical down-hilling maneuvers. Envision harsh rock staircase, followed by zig-zag turn, followed by severe rock staircase, followed by zig-zag turn, followed by … well, you get the picture. 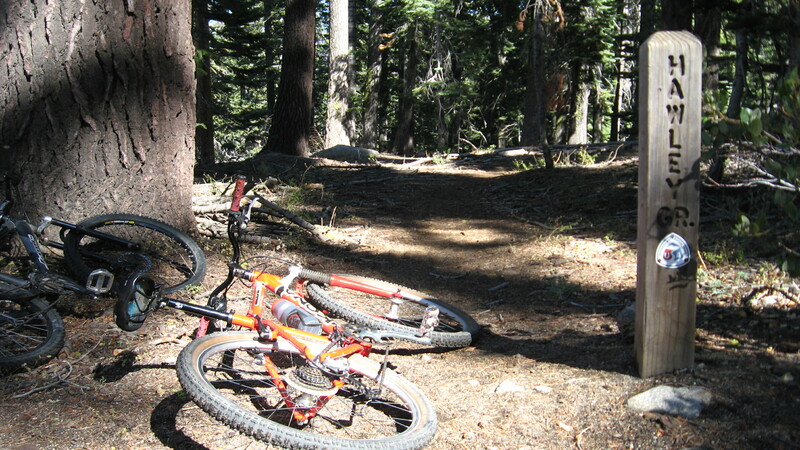 Thankfully, this trail boasts some of the best dirt in Tahoe – none of that Tahoe sand which local mountain bikers share a love-hate relationship with. 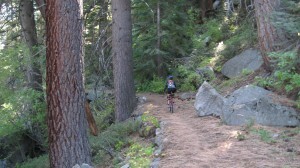 After about a quarter mile of technicality, peddle out of the switchbacks onto soft, pine needle-laden straight-aways. What makes these long, dirt stretches even more thrilling, besides an accumulated speed of 20 mph, is a slide-prone hillside setting. There truly is no margin for error when a cliffside presents itself inches away from the edge of your tire. Eventually, the trail’s pine canopy opens up, with a brief climb up to a bouldery vista point, marked by a lone, bare, Dr. Seuss-like tree. 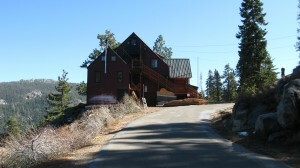 Take a breather while overlooking Christmas Valley, Twin Peaks, and distant Lake Tahoe, before continuing on to a quarter-mile tract encrusted with loose granite. 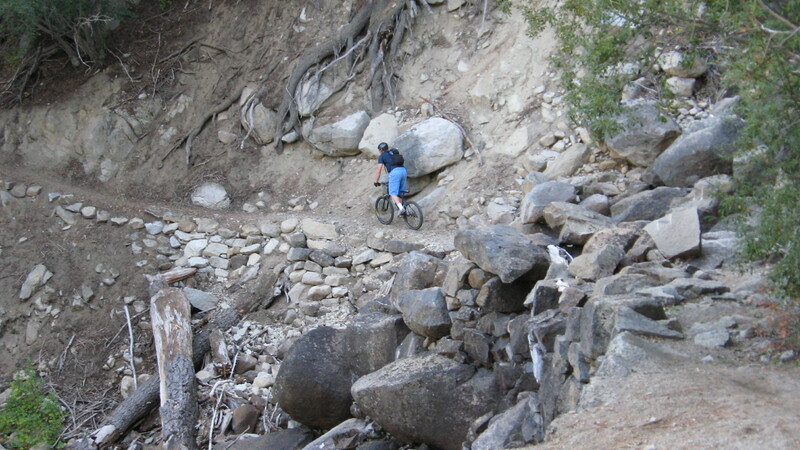 The grand finale of this section requires a technical crossing over a rocky, has-been waterfall. 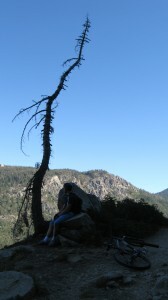 Hawley Grade’s 200-foot falls over this spot are magnificent in the early springtime, just after snowmelt. 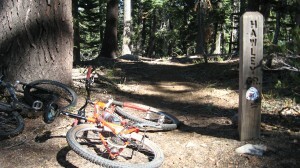 The once again pine-shaded trail returns to its signature soft dirt, cliffside, straight-aways. 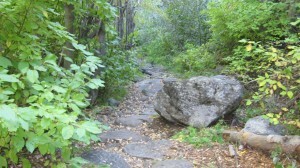 Within half a mile, near the end of this short, steep single-track, the trail narrows onto a creek bed. Find the smoothest line and hopscotch from water-polished rock to glossy rock. 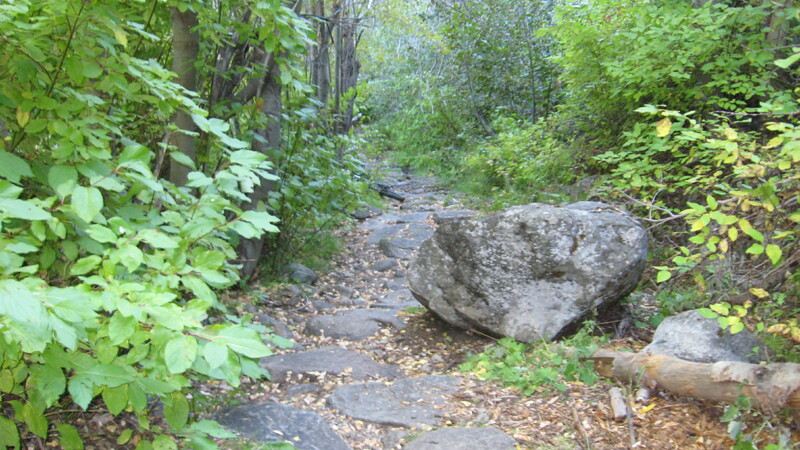 Soon, these rigid rocks transform into loose, creek bed run-off pebbles, which wash out onto a wider dirt-packed trail, lined by small cabins amidst a meadow. Hawley Grade dumps out onto South Upper Truckee Road near a quaint field engulfing the Upper Truckee River. A shuttle car should be parked here, next to the Hawley Grade trailhead, before the bridge. Be aware, Hawley Grade is a popular hiking trail, especially among South Upper Truckee Road residents, so watch for uphill hikers. Many gung-ho bikers do Hawley Grade as a loop, starting at the road-closure gate on unsigned Old Meyers Grade, the first right off South Upper Truckee Road. 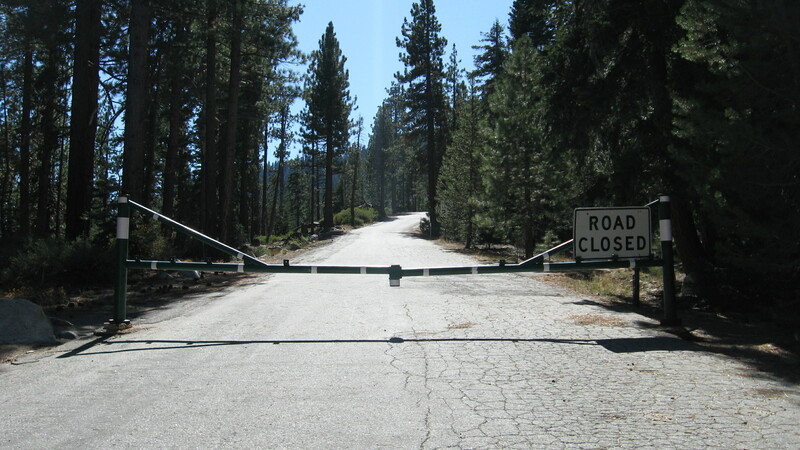 Climb 1.8 miles to Highway 50, cross Highway 50, and continue your ascent on nearby Echo Summit Road. After three switchback turns, behold Echo Summit Lodge and take the next left onto unsigned Echo Summit Road North. Neglecting spur driveways to vacation cabins, stay straight to the top of the climb at 2.5 miles. 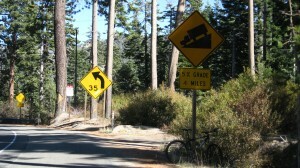 Descend half a mile more to Echo Summit Road North’s junction with Highway 50, next to a Caltrans Maintenance Station. Turn left on Highway 50 and make your first right onto unsigned, dirt Echo Summit Road South, just before a curved 35 mph sign. 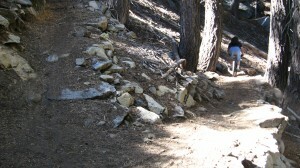 Hawley Grade’s trailhead marker is 30 feet ahead on the left. 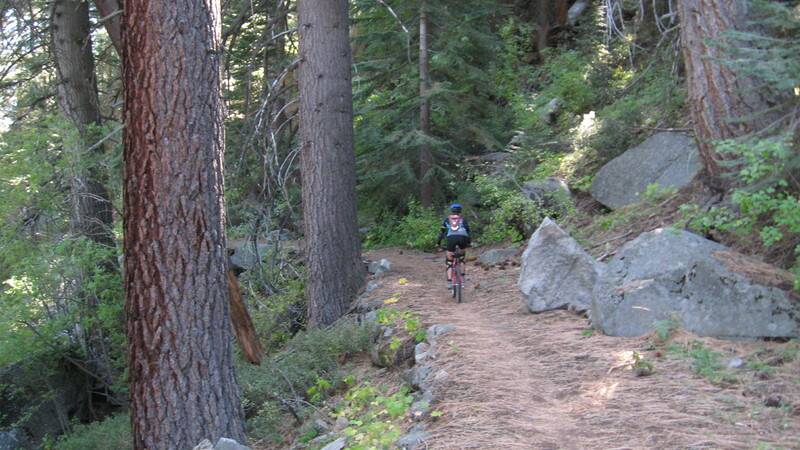 At the bottom of Hawley Grade, turn left onto South Upper Truckee Road to relish 3.5 miles of smooth pavement back to the car – quite the change from Hawley’s challenging stone staircases and rock gardens. 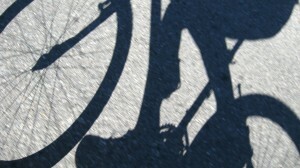 Hey I love this artical..I love walking that grade but riding it?? ?